Blue Ivy is one popular kid! 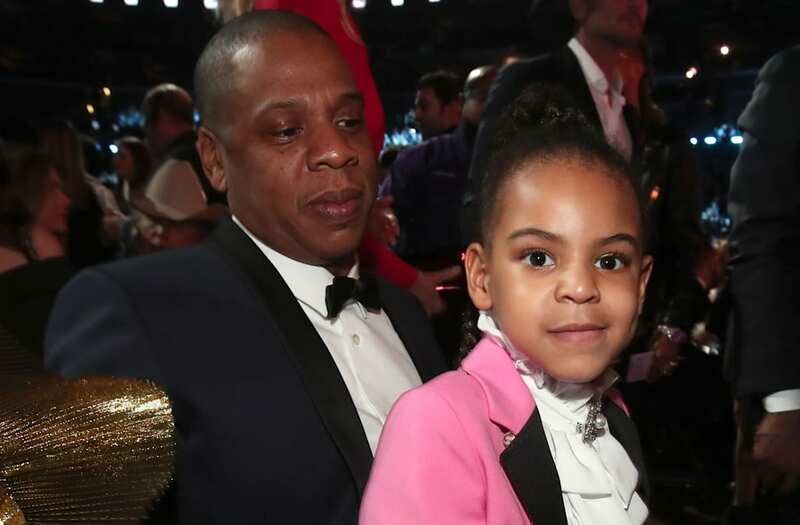 Beyoncé and Jay Z's 5-year-old daughter was all smiles while making new friends at Sunday's GRAMMY Awards. Dressed in a pink Gucci tuxedo suit with black lapels over a white button-up shirt, Blue was first greeted by Rihanna, who was up for eight GRAMMY awards, including Record of the Year. 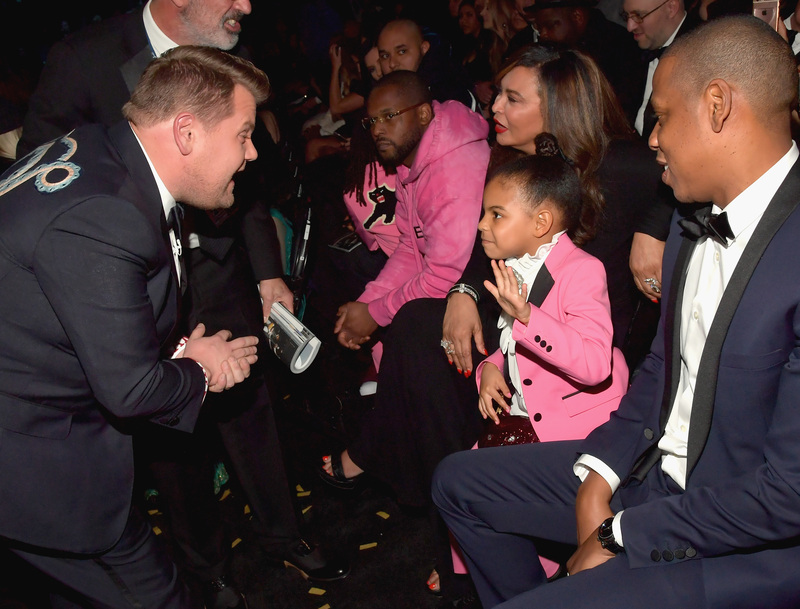 In between commercial breaks, James Corden also made his way over to Blue, who she shared a few high-fives with. And, it looks like she took a liking to the GRAMMY host, as she later joined him during an impromptu musical performance of "Sweet Caroline," along with John Legend, Faith Hill, Tim McGraw, Keith Urban, Neil Diamond and Jennifer Lopez. Recording artist Adele performs onstage during The 59th GRAMMY Awards at STAPLES Center on February 12, 2017 in Los Angeles, California. Recording artist Chance the Rapper accepts the Best New Artist artist award onstage during The 59th GRAMMY Awards at STAPLES Center on February 12, 2017 in Los Angeles, California. Host James Corden speaks onstage during The 59th GRAMMY Awards at STAPLES Center on February 12, 2017 in Los Angeles, California. Host James Corden performs onstage during The 59th GRAMMY Awards at STAPLES Center on February 12, 2017 in Los Angeles, California. Recording artist The Weeknd performs onstage during The 59th GRAMMY Awards at STAPLES Center on February 12, 2017 in Los Angeles, California. Recording artist Ed Sheeran performs onstage during The 59th GRAMMY Awards at STAPLES Center on February 12, 2017 in Los Angeles, California. Recording artists Josh Dun (L) and Tyler Joseph of music group Twenty One Pilots accept the Best Pop Duo/Group Performance award for 'Stressed Out' onstage during The 59th GRAMMY Awards at STAPLES Center on February 12, 2017 in Los Angeles, California. Actor John Travolta speaks onstage during The 59th GRAMMY Awards at STAPLES Center on February 12, 2017 in Los Angeles, California. Musicians Peter Martin (L) and Robert Dillon of Third Coast Percussion onstage at the Premiere Ceremony during the 59th GRAMMY Awards at Microsoft Theater on February 12, 2017 in Los Angeles, California. Producers Juliette Larthe (L) and Nathan Scherrer accept the Best Music Video award for 'Formation' onstage at the Premiere Ceremony during the 59th GRAMMY Awards at Microsoft Theater on February 12, 2017 in Los Angeles, California. Host James Corden onstage during The 59th GRAMMY Awards at STAPLES Center on February 12, 2017 in Los Angeles, California. Singer Jennifer Lopez speaks at the 59th Annual Grammy Awards in Los Angeles, California, U.S. , February 12, 2017. 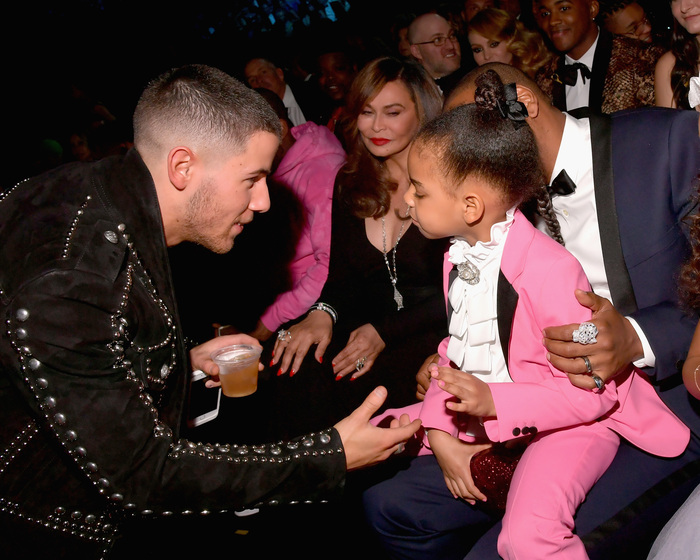 Before the night ended, Nick Jonas was able to share a sweet moment with Blue, as she sat on her dad's lap. 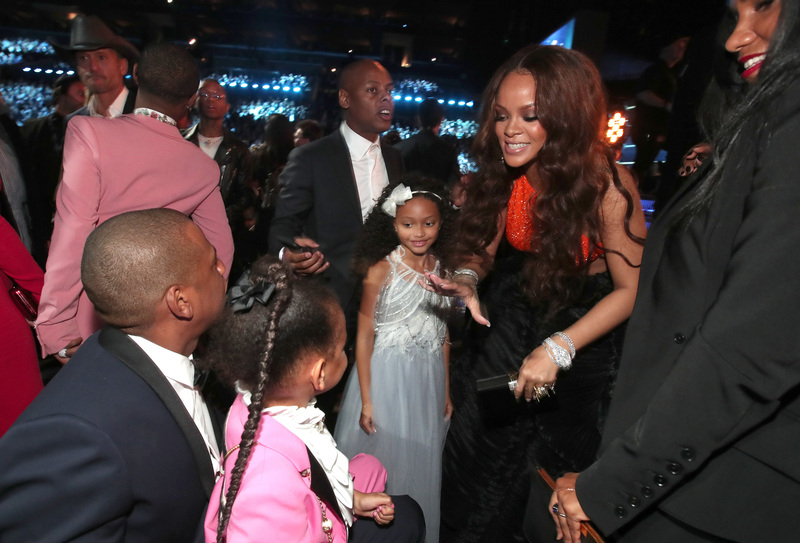 Music's biggest night also included adorable moments between Blue and Bey. Watch the video below for more of their adorable mother-daughter moments.